Sticky rice cakes in the shape of male and female genitalia (called SAYARIBO) are made by local parishioners and sold (to be eaten) as good luck charms on the day of the day before Little New Years at the Takasai Jinja Shrine in Shimotsuma. They are now believed to be good for marital harmony, conceiving a child, easy delivery, sexual health- and fertility in general! Before the Meiji Restoration of 1868, though, and these MALE and FEMALE symbols were connected to Mikkyo (Esoteric Buddhism) which stressed the importance of balance between the male and female forces. Now if its name is recognized at all (on a national scale), it is because of the novel, manga, and then very successful and highly acclaimed film: SHIMOTSUMA MONOGATARI (下妻物語 released in 2004) – which in fact makes fun of it for the rural backwater it has actually become . But for centuries – more than a millenia in fact, the area that is now Shimotsuma , Tsukuba City`s neighbor to the north-west, was a major transport hub in the Kanto Area. Situated between two major rivers, the Kokkaigawa and Kinugawa, it thrived in the days when in this region the cheapest and most convenient way of moving goods and people was by water. Its docks bustled with brisk trade all the way up to the time when railroads and then cars and trucks finally drove them out of business, making Shimotsuma`s HEYDAY a thing of the past (the city`s economy is fuelled today by its various pork products). Naturally there were also overland routes leading to and from this key river port. One of them was a road which headed towards (and from) Mt. Tsukuba- running parallel for a while to the present Rt. 125- part of the connection to the ancient regional capital of FUCHU (present day Ishioka) which was established in the 7th century as the regional capital (KOKUFU-). 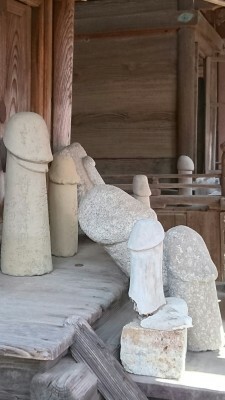 Phallic carvings left at the shrine as offerings. Centuries later this road was still important, especially for linking the Shimotsuma area with Tsuchuira (which was also an important port town on the shores of Lake Kasumigaura. Naturally, those who used the roads, especially those in the transport trade, were always concerned about their health and safety along the way. In past ages, it was extremely popular for richshaw drivers, palanquin bearers, pilgrims- or anyone using the roads, to pray to a deity variously called: DOSOJIN, DOROKUJIN, or SAI NO KAMI- all written the Kanji Characters: 道祖神. That is why it is not surprising that along this road, about halfway between the present Shimotsuma Station (on the Joso Line) and Hojo ( a once thriving commercial town near the foot of Mt. 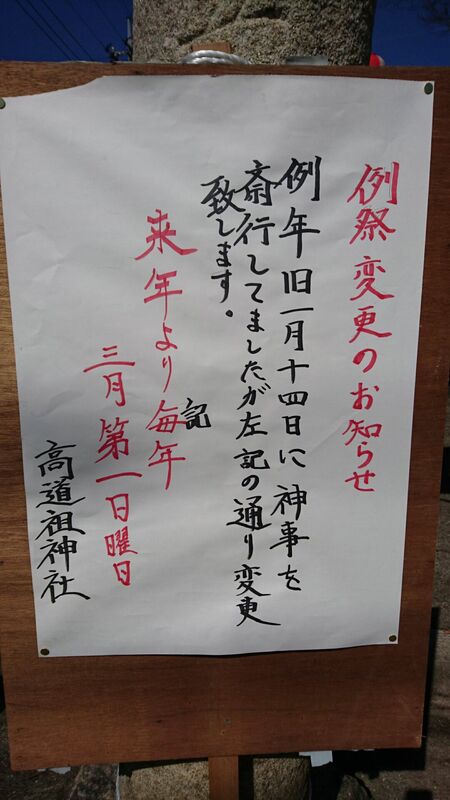 Tsukuba), there evolved a spot at which to pray for road safety. This spot is now an amalgamation of more than one shrine which once stood in the area and it is called TAKASAI JINJA (SAI , or SAI no KAMI, is another way of referring to DOSOJIN)*. There are hundreds, perhaps thousands of DOSOJIN (pronounced: DOH SO JIN) shrines spread through Ibaraki Prefecture, and dozens right here in Tsukuba City. Most of these are extremely simple- old stones with the characters: 道祖神　engraved on them. Many so old that these inscriptions are no longer visible. Some DOSOJIN, however, are a bit grander, with their own shelters- looking like miniature shrines. Then, there are a handful of DOSOJIN in the prefecture, including the TAKASAI SHRINE (高道祖神社) in Shimostuma City`s Takasai (高道祖), which have grown to become large shrines. DOSOJIN were often originally placed at the entrances to villages or along roads- but can in fact now be seen anywhere, as new roads have been built and residential areas expanded. 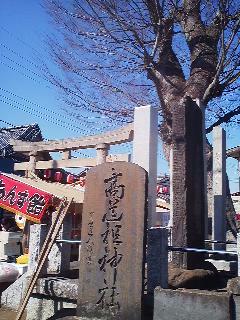 Many have also been moved, because of construction or development to the precincts of other shrines or temples. The DOSOJIN are worshipped for various reasons depending on region. Even within Tsukuba City itself, this deity (often called DOROKUJIN in this area) can have a different function from village to village. The main powers of this deity are variously believed to be: protecting the village from evil, protecting travellers, keeping the legs and lower back healthy, keeping the sexual organs functioning properly and preventing STDs, maintaining marital harmony, and even helping the lonely to find a good match. Typical offerings left by those who want to pray for their legs or back are two-pronged vegetables (especially daikon radish) which might be dug up in the fields, while travellers (especially pilgrims), would leave straw sandals. 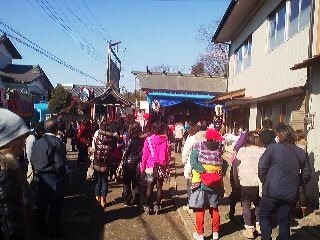 All day long there is a continuous procession of worshippers on the day of the festival. The building in the background with the blue curtain hanging down is the prayer hall. 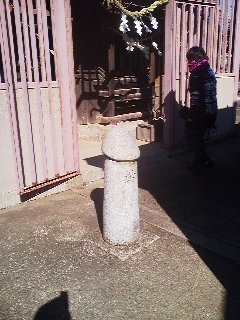 At the Takasai Jinja Shrine, there are plenty of these rustic old phalluses, which can be seen on any day of the year. What makes this shrine unique, however, is that on the day of its SAYARIBO MATSURI FESTIVAL (塞り棒祭 -さやりぼう), male and female genitalia MADE OF GLUTINOUS RICE (by the local parishioners) are sold as amulets (Omamori) which are meant to be taken home, grilled, and eaten! These symbols of the male and female forces are sold in four different sizes at prices of 500, 1,000, 5,000, and 10,000 yen, respectively. Behind the Main Hall of the Takasai Jinja Shrine is the smaller Dosojin Hall. The shrine did brisk business as I got there in the early afternoon on the day of the festival. Five or six of the typical festival stalls had already been set up selling toys and food ( for exhorbitant prices) and the whole time I was there, there was a steady stream of worshippers and customers for the SAYARIBO (the curiously shaped rice cakes). There were young couples, grandparents with grandchildren, mothers with daughters, there was even a whole group of little kids that had come together with their day-care center or kindergarten teachers for the event ( though it was a Saturday) !? The shrine`s prayer hall was full of worshipers. Inside the priest was offering blessing for those who wanted to, but were having trouble conceiving a child. These prayer sessions would last thirty minutes or so and were held regularly throughout the day. 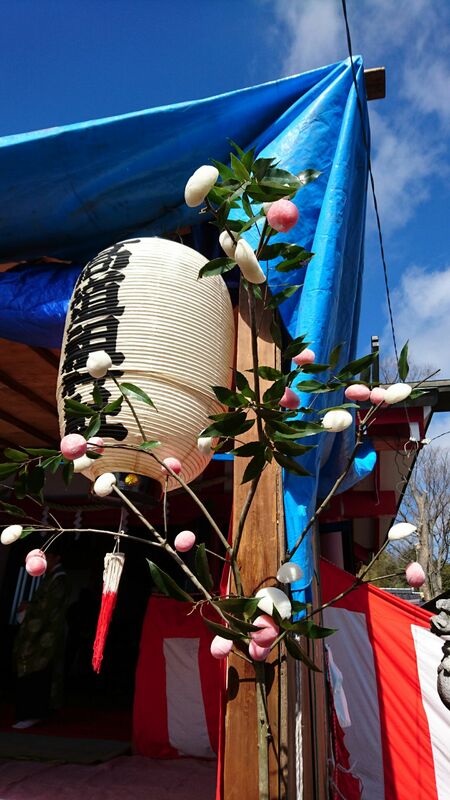 I also noticed that the shrine`s hall had been decorated with NARASE MOCHI- round rice cakes skewered onto the broken off branches of a tree. This is a typical decoration of Japanese Koshogatsu (小正月), literally Little New Year`s, which traditionally takes place on the the first full moon of the new year. 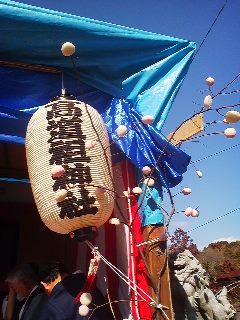 The rice cakes are ROUND, representing the full moon, and also represent a prayer for abundant rice harvests. And since the moon was traditionally believed to be connected with human fertility I could understand the general thinking which led to the evolution of this particular festival. 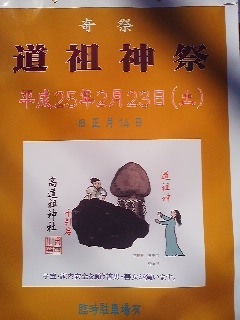 As is the case with so many other Koshogatsu events, NARASE MOCHI are put up as a prayer for good harvests and fertility for all things, and this is then symbolically echoed, or amplified by the SAYARIBO rice cakes which represent a prayer for the conception of children and being fruitfull and multiplying. This is why the festival is a popular pilgrimage for couples who have been having trouble having a baby. 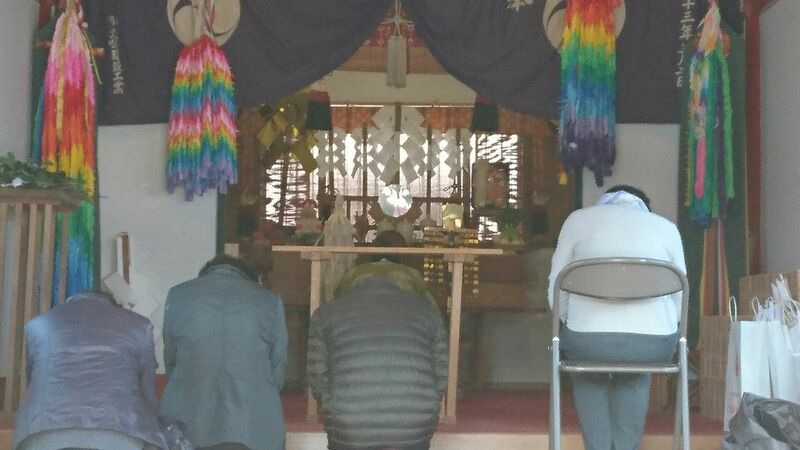 Indeed such couples- or wives and mothers-in-law do seem to come from far and wide to pray at the Takasai Jinja on the day before Koshogatsu ( the first full moon of the year). Going around the back of the main hall I found the smaller shrines which house the numerous phalluses- forged in wood, stone, ceramic or in paintings- had been offered. As I was taking some photos, an older man who seemed to be a local, came by to drop coins into the various offering boxes. Seeing me, he asked me if I found this shrine to be unusual. 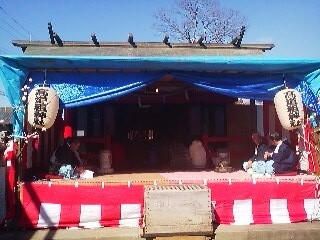 We got into conversation, and he told me that he visited this shrine EVERY month on the day before the full moon ! 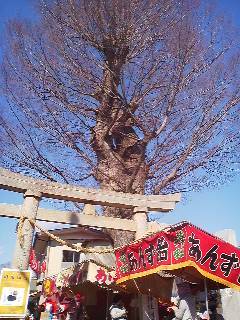 The Prayer Hall of the shrine was decorated with NARASE MOCHI ( rice cakes skewered onto the branches of a tree)- a typical feature of Koshigatsu, the celebration of the first full moon of the new year. They are symbolic of GOOD HARVESTs. Instead of rice cakes, some areas (Asakusa in Tokto, for example) use little round balls on the branches- symbolic of coccons (Silk used to be the most important product of the Kanto Region. * The shrine now called Takasai Jinja was actually called Hie Jinja Shrine for many centuries. 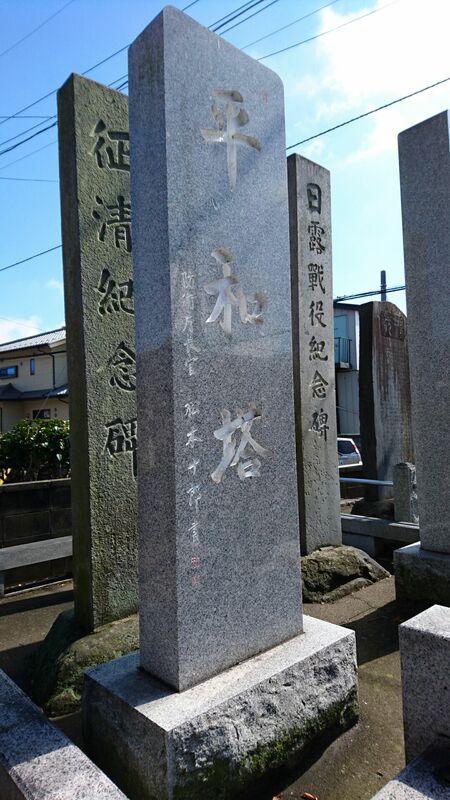 It was designated the official Village Shrine (村社) in 1874 and then in 1913 it was merged with the ancient DOSOJIN Shrine and the name was changed to TAKASAI JINJA. IThis means that before 1874 this place of worship was associated with Mikkyo (Esoteric Buddhism) which strongly stressed the need to maintain a balance between the male and female forces. ** It is my opinion that the DOSOJIN which are in the shape of phalluses ( DANKON, in Japanese), can be found in places which were once connected with prostitution. Of course, in Japan this was also associated with travel, since historically there were special houses and inns located along the major roads to cater to travellers and pilgrims. 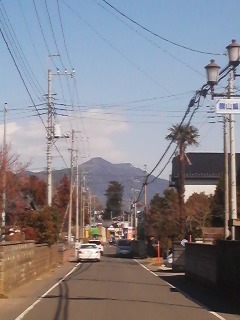 The Takasai neighborhood in Shimotsuma, was in fact a post town which had several inns. 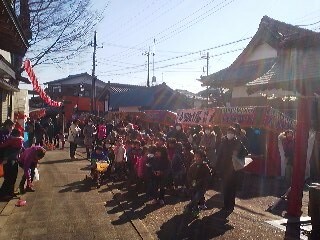 Another unusual traditional event held in Shimotsuma is the Tabanka festival. 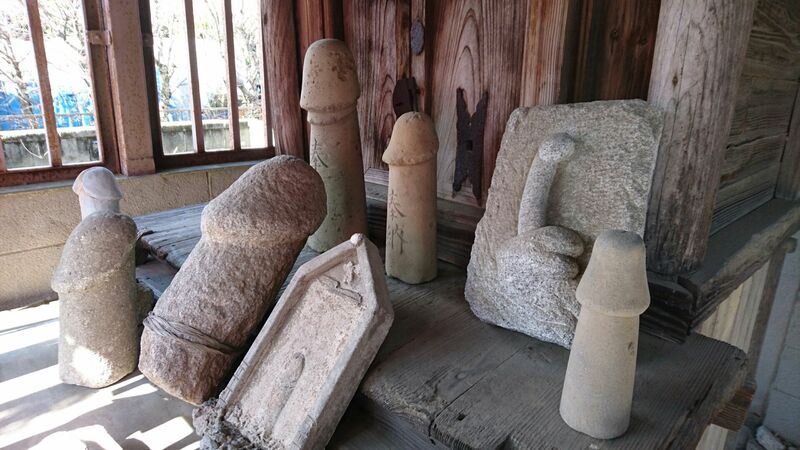 There is also a striking (and almost completely unknown) “phallus shrine” in Tsukuba City`s Yatabe, district.